Any time we get a chance to see a show at the Aronoff Center as a family we take it. 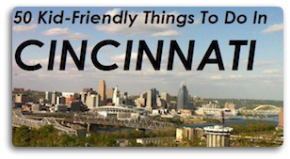 There’s something about heading out together to see what promises to be amazing theatre in a fantastic location like the Aronoff Center that never fails to excite us all. We usually make a night of it with dinner downtown, the show, and even sometimes a sweet treat afterward (ahem, Graeter’s anyone?) 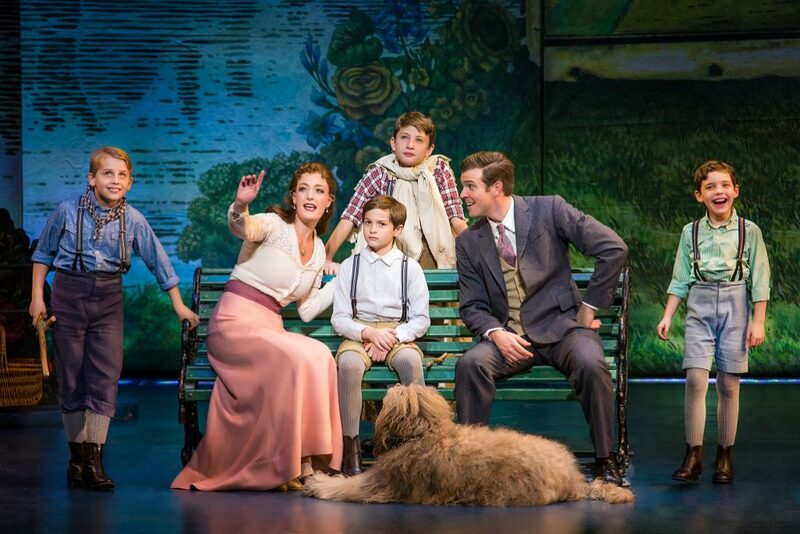 Luckily we were able to see Broadway in Cincinnati’s FINDING NEVERLAND when it opened last week and it was a wonderful, heartwarming show. If you’ve ever wondered how the story of Peter Pan came to be, then get your tickets now before the show moves on to its next city. We laughed, we teared up just a little, we felt the same heartbreak and joy that the characters on the stage felt as they laughed and cried and created a whole new world together. 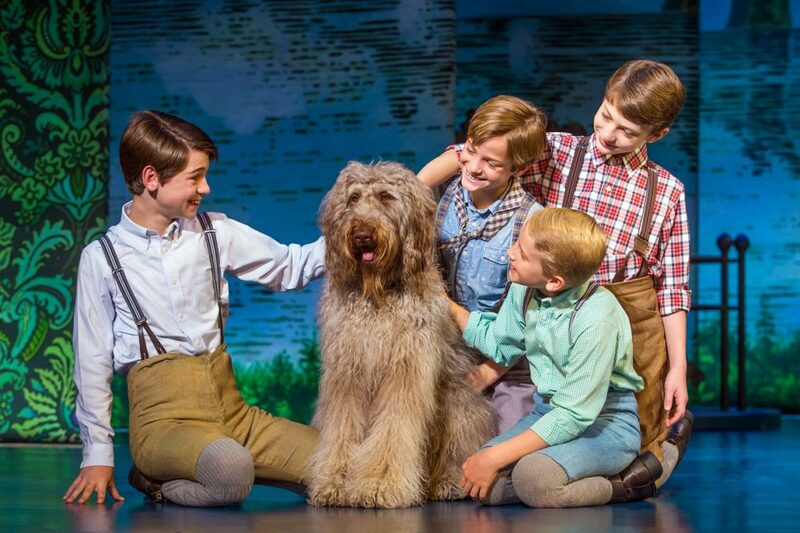 The kids of FINDING NEVERLAND are some of the most talented you’ll see on stage, and their furry castmate Sammy (who plays Porthos the family dog) is a serious show (and heart) stealer! The entire cast is wildly talented. If you are vintage (like yours truly) you’ll remember the shows Captain James Hook, John Davidson, from his 80’s heartthrob days. 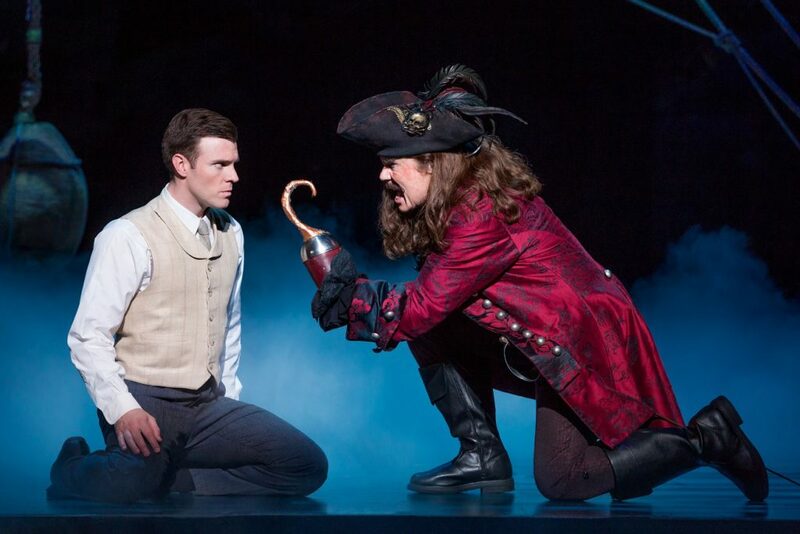 He still kills it on stage with just the right amount of swagger to make you fall in love all over again with the pirate to end all pirates and Peter Pan’s foil. You really don’t want to miss this wonderful show! Some subject matter may be a little too weighty for young theatre goers (the characters deal with the death of a parent throughout the show) but children 7 and older are certain to love every minute. There are, of course, appearances by the Lost Boys, Tinkerbell, the swaggering Captain Hook – and of course our hero, Peter Pan. If you grew up loving the story of Neverland you are in for a treat. Get your tickets online at Broadway in Cincinnati: www.cincinnati.broadway.com/. For your convenience, the Aronoff offers valet parking for $10 on the corner of 7th and Walnut St. near Jeff Ruby’s. Street parking is scarce, but you can also find ample parking under Fountain Square. While you are downtown make a night of it like my family does! Head to Bru Burger or Rock Bottom Brewery for dinner or appetizers before the show, or Graeter’s for a sweet treat. And don’t forget – the Fountain Square Ice Rink is NOW OPEN! Take a turn or two around the ice before you head to NEVERLAND – what a magical evening it will be. Enjoy! Disclosure: We were provided with tickets to see FINDING NEVERLAND on opening night in order to share our experience at the show. As always, all thoughts and opinions above are 100% our own.